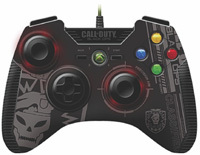 The first pictures of MadCatz's Black Ops controllers have been released. 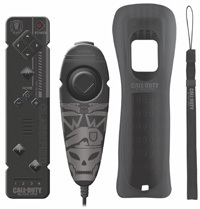 And yes, this is the same MadCatz that released those Modern Warfare 2 controllers last year. These themed PrecisionAIM Controllers do actually offer more than just "good looks", for example, you can slow the analog stick movement for more precise aiming. Both the Xbox 360 and PlayStation 3 PrecisionAIM controllers cost $50 a pop and the Nintendo Wii Controller Pack $40. The PC Stealth Controller will cost $30 and the PC Stealth Gaming Surface $20. Check out some of the peripherals below.